NE FEATURE OF A VERY UNIQUE Philadelphia neighborhood called “Overbrook” is the International Institute for Culture (IIC). The Institute began in 1989 in response to Pope John Paul II’s call for cultural re-evangelization, and since that time has organized lecture series, language programs, cultural celebrations, international conferences, educational seminars, and art exhibitions. It has also hosted many musical performances. Everything the IIC offers attempts to showcase the cultural heritage of Holy Mother Church. Their self-stated goal is to “look at the way in which the Faith has shaped cultures in the past and the culture in which we live today, the manner in which it preserved and elevated whatever was good and noble in any culture that it encountered and repudiated whatever debased the human spirit.” It is an organization with high aspirations. One of the ongoing seminars they offer is called ”For the Love of Music.” These seminars follow an interesting procedure. First, they listen to a live performance of a piece of classical music. Then, the musicians reflect on what they see & hear in the composition and participants are invited to ask questions & share thoughts. Finally, the whole group listens to the same piece performed again. 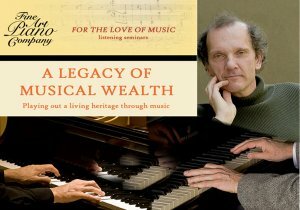 Described as a “master class for listeners,” this series is a great way for lovers of music to grow in their appreciation for the nuances of various composers and styles. As one example, the Institute is hosting a session this afternoon at their Ivy Hall headquarters. Featuring pianist Rollin Wilber, attendees will hear selections by C.P.E. Bach, Scarlatti, Beethoven, Grieg, Schumann, Chopin, Debussy, Rachmaninoff, and Villa-Lobos. More information can be found here. May the efforts of the IIC and other groups like it help to foster a new “civilization of love”!